Jimmy Carter has revealed his grandson, Jeremy Carter, has died at the age of 28. The former president made the announcement to a church class on December 20 – just two weeks after he charmed the same group by revealing his grandson had beaten cancer. 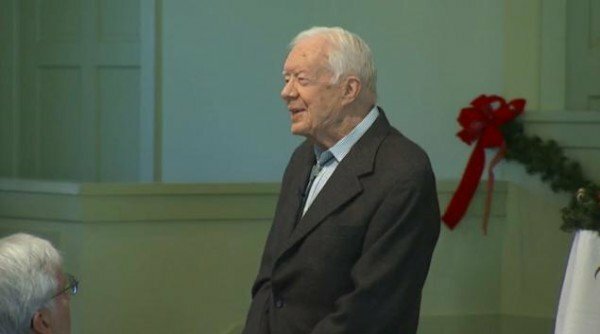 According to the Atlanta Journal-Constitution, Jimmy Carter arrived about 25 minutes late to his weekly class at the Maranatha Baptist Church in Plains, Georgia, and told the congregation his grandson had died just hours earlier. Jimmy Carter said Jeremy was not feeling well on December 19 and took a nap in the family’s Peachtree City home. Hours later, his mother found him and realized his heart had stopped, the former president said. He died in a hospital on December 20, and the cause of death has not been announced. Churchgoers told the newspaper Jimmy Carter broke the heartbreaking news, then continued with his class and even stayed to take pictures with those in attendance. Jimmy Carter, 91, teaches a class at the church every Sunday. Earlier this month, he used his lesson to break the news that months of treatment had eradicated his recent cancer diagnosis.